I don’t care what all the baby experts say, how many checklists you complete, or how many “proven” products you purchase–there is no such thing as babyproof. Like all first-time parents, Steven and I made a genuine and deliberate effort to make our house a safe haven for our daughter well before she had even grown out of her newborn diapers. Hell, Steven made the rounds covering every electrical outlet in the house months before Cadence was even born. I got a lot of exercise, squatting down to pry those damn plastic covers off every time I needed to plug something into the wall, then hefting my very pregnant body back into a standing position again. Yet, it doesn’t matter how carefully you plan, or how many fool-proof products you buy, once your child is mobile, all bets are off. So far, we’ve been pretty lucky. Cadence actually listens pretty well for a 13-month-old, but of course, we have to be mindful. Doors must remain closed. Cabinets that house dangerous items must be locked. Cell phones and remote controls left unattended are like homing beacons. A toddler will find them every time, and getting the devices back is a delicate operation best performed by seasoned professionals–Navy Seals, trained hostage negotiators, or Indiana Jones himself. We know we have only begun to scratch the surface with Cadence’s explorations. She has already figured out how to climb, and has been attempting to figure out how to reach the summit of the couch, using different toys, pillows, blankets and books to get her there. Any boxes left lying around–empty diaper boxes, flat-rate USPS boxes, etc.–are instantly transformed into stepstools or dance floors, depending on what kind of mood she’s in. Tonight, Steven coralled her in the kitchen so I could vaccum the house, and she was ever so helpful cleaning out a couple of drawers while her Daddy did the dishes. Nothing says fun like Ziploc bags, ice cube trays and dish towels. 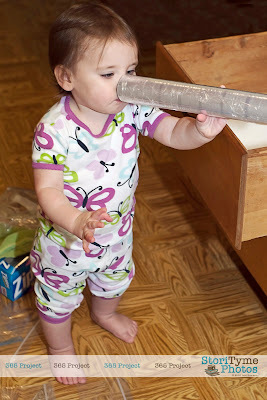 Digging a little further, Cadence happened upon a half-used roll of Saran Wrap and spent the next twenty minutes looking through it, picking at the edge of the plastic, pretending to drink out of it, and then yelling into it and laughing at the loud voice that came out. 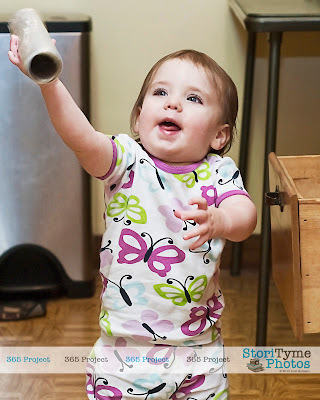 We let Cadence play, and I snapped a few photos of the mayhem. 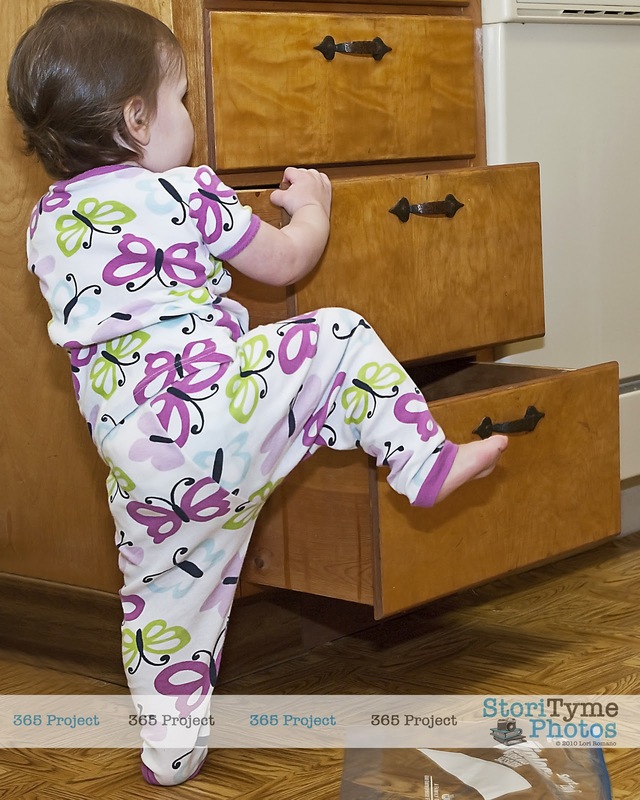 There was nothing in the drawers that could hurt her, and what would be the point of putting an end to her fun? 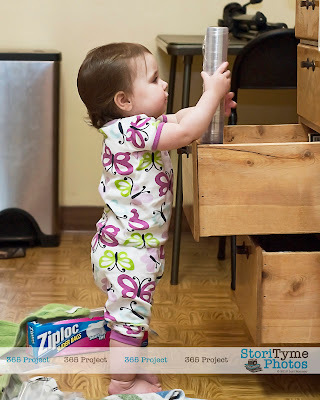 Kids explore and get into things. That’s their job. We as parents must walk the line between letting them learn and keeping them safe. By all means, bolt those heavy shelves to the wall, keep those knives and poisonous liquids locked up tight, and put a cover on every electrical outlet you can find. But while you’re busy keeping your children safe, make sure you’re letting them have a little fun too. Cadence had a blast, right up until she started to figure out that she might be able to use the drawers to climb up on the counter. Then, it was time for Momma to put the camera down and pull the old bait-and-switch with a bottle of milk and bedtime. Today’s 365 Project is dedicated to our little explorers and to the silly “experts” who still think it’s actually possible to babyproof a house.